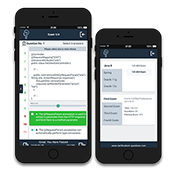 Study for your IT Certification with our Mobile App and Web Simulator! The Final Certification Exam has never been easier. 100% Money Back and Quality Guarantee! Certification Questions - Why we are so special.. 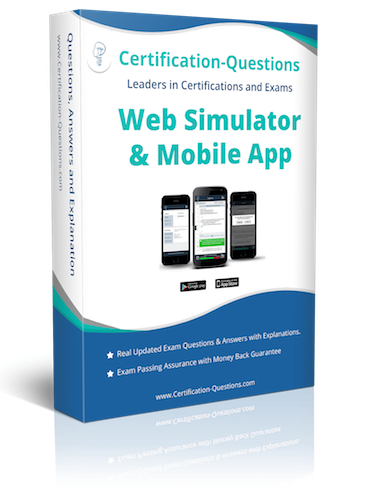 Welcome to Certification-Questions.com where we deliver certification questions with answers and explanations to help students obtain their Certification by using our Online Web Simulator and Mobile App. Try our free tests and remember that 97% of people who used our certification questions successfully passed the final exam. Our products are based on a Web Simulator that is always available online or via our Mobile App. It is not necessary to worry about the updates of the questions as we always update our question bank. Remember: all our material is covered by a 100% refund policy. After the big success of our Certification Questions Web Simulator which works without having to download any software full of maleware, spyware and ads that slowdown your PC, we continue to improve the way you study! Now you are able to enjoy and access our products from everywhere with our new Mobile App available on Apple and Android. Wherever you will be, at home in front of your PC or on the go, just remember to always use the same subscription On Line and On Mobile. Please take a moment and read what they say about their experience with our Certification Questions. "I took the certification exam last October 29 and I passed it with 86, the simulators helped me a lot because the questions are harder than the real exam and they cover many issues. It helps a lot to study and achieve the expected results in the exam, inclusive the company responded my doubts. I'm so happy with this simulator, and I recommend it"
"I took the certification exam last August 30 and I passed it with 88%. Your mock exams helped me a lot because the questions are harder than the real exam but they covered every important issues. You'll probably find fewer questions on xml configuration but this simulators this simulator helped a lot with my preparation because I had the opportunity to study each topic in depth." "Hi, I scored 91% in the Core Spring 4.2 exam using your mock exams. I would recommend them to anyone. Regards, Jude Regan Software Developer"
"Hi I am Praveen Nelson, a Linux Systems Administrator. Recently I started to improve my Java programming skills and that's why I decided to take the 1Z0-808 Certification. Thanks to you I had a chance to practice, study and understand all the new features!! Your Web Simulator is fast, beautiful and fun... the contents are perfect and to pass the final exam with 90% of scores was amazing. Thank you!!! Praveen Nelson System Administrator"